In anticipation of the upcoming Puppy Bowl X, Michelle Obama arranged a “training camp” at the White House recently as part of her Let’s Move! campaign to fight childhood obesity. Invited to attend were 13 shelter puppies, along with 12 students from Harriet Tubman Elementary School. Of course, the presidential pets, Bo and Sunny Obama, were there to put things into gear, lining up the visiting pups for their playtime. The children had fun playing fetch and running with the dogs — and everyone got plenty of exercise. The pets also got to practice their chewing skills (with toys) and participate in tire and tackle drills. Michelle Obama, a firm believer in the power of exercise, says walking and playing with your pets allows you to stay active while having fun at the same time. Segments of the White House training camp event will be featured during the Puppy Bowl on the Animal Planet network on Sunday. 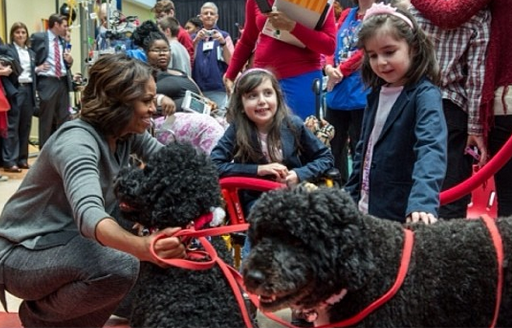 Michelle Obama, with Sunny (center) and Bo (left), visit with children. 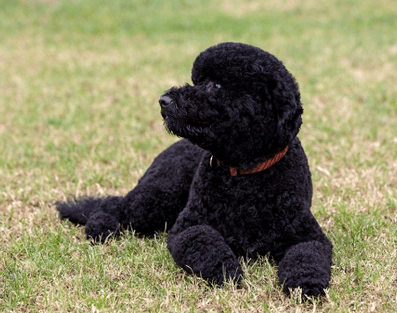 No particular VIP treatment was given to President Obama‘s two Portuguese water dogs during a recent family vacation in Hawaii, at least as far as quarantine procedures went. Those strict regulations were enforced upon the presidential pooches, just as with all other pets who visit the Hawaiian islands. The state requires all visiting dogs to go through certain quarantine procedures. Bo and Sunny were no exception. They underwent a rabies blood test as well as numerous tests to show they were not carrying any bacterial or viral diseases. Pets that do not follow these procedures can be quarantined in Hawaii for up to four months. The one difference in the presidential pets’ check-in strategy? Bo and Sunny were inspected by a military veterinarian upon their arrival at Hickam Air Force Base, whereas other pets have their inspections performed through a quarantine office at Honolulu International Airport. After more than two weeks on vacation during the year-end holidays in Hawaii, President Obama returned to Washington yesterday. First Lady Michelle Obama stayed behind for a few more days in Hawaii before her upcoming 50th birthday, which is January 17. 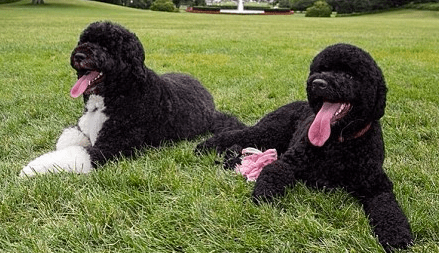 The two dogs apparently traveled back to Washington, D.C. with President Obama and daughters. First Family selfie — Michelle and Bo Obama, August 2013. Yesterday, “selfie” was officially recognized as “word of the year” by Oxford Dictionaries. For those of you who have no idea what we’re talking about, a selfie is just a casual photograph that you have taken of yourself, usually with your smartphone. According to Judy Pearsall, director for Oxford Dictionaries, the word has actually been in use since 2002. However, self-portraits have grown more popular with the spread of social media such as Twitter and Instagram. 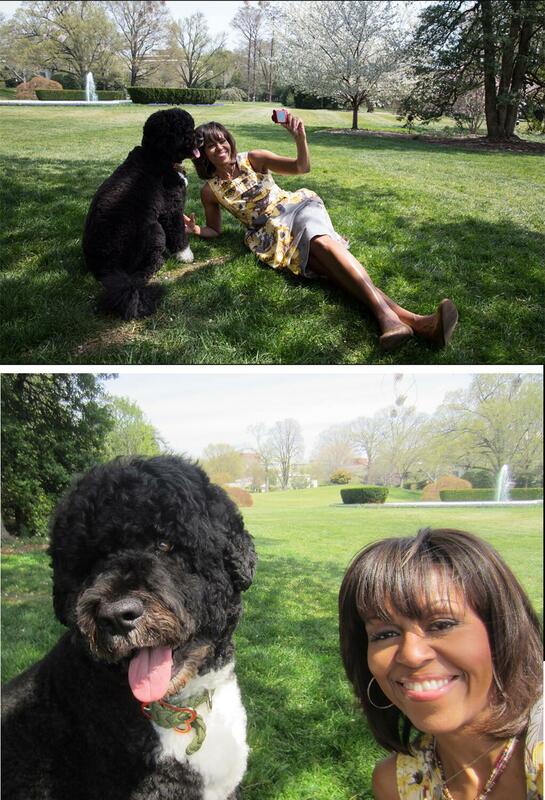 In August, Michelle Obama shared on Instagram a selfie of her and First Dog Bo Obama enjoying the beautiful outdoors. The snapshot became part of National Geographic’s Great Nature Project, which aims to become the world’s largest online collection of animal photographs. Now, the TODAY show has announced that the Michelle/Bo Obama selfie has also become one of the nine most memorable selfies of the year, according to results of a poll initiated by the TV show.